...so there we are, Layla and I, chatting one recent afternoon in the funduk coffee shop with Dr. Basma, a history professor at Basra U. Over cups of chai, the conversation meanders from the Battle of the Camel to the Dutch East India Company and the Sublime Porte to today's religious conservatism among Basma's students. Outside, the day is hot and dry enough to dehydrate a sponge, overriding the funduk a/c system until, growing uncomfortable, Layla divests her abiya to carry on the interview in a scarf, long sleeved blouse and blue jean flairs. All perfectly modest, of course, nothing like the T&A jigee-jiggling on the Arab music videos blasting from the television behind us. In walks a man, who plants himself in front of the TV. Even as Dr. Basma recounts how increasing numbers of students are shrouding themselves in hejab, this worthy sits transfixed by the televised bevy of dark-eyed houri prancing and dancing and rotating their heads until their long, thick, black-as-the -Kaaba tresses spin like propellor blades. The irony is not lost at our table, although we don't mention it. The man, however, feels no such discretion: soon, instead of Lebanese teens in adornment-revealing half-cut tees and crotch-level jeans, he's staring at us--staring with the same blank, dull, malevolently stupid glare I've encountered so often in this country. I tense; Layla, sensitive by now to my misplaced gallantry, cautions, "I know, I know, just ignore him..." while Dr. Basma talks gamely on, trying to blot the intrusive gaze from her consciousness as well. But I can't restrain myself, it's hackle-raising, this constant stare. "Eindak mooshkelah?" I snap, ("You have a problem? "), the man starts, garbles something in Arabic, looks back to the TV for moment--then turns to glare at us once more. By now I'm thinking, What would happen if I punched this guy? when fortunately, Layla leaps up, murmurs with exasperation, "It's me, it's me..." and proceeds to re-abiya herself. Muslim dignity restored, the man returns to oggling the video vixens in their chadorless abandon, hair, limbs, hips moving with the freedom Iraqi women experience only in their dreams. Ah yes, I think, the tanker truck men all over again, the same gutfull of squelched anger shot through with helplessness and frustration. And once more, I'm reminded that the real agents of Iraq's fate are not media-friendly issues like the "insurgency" or the "Occupation" or even the upcoming constitutional convention--but rather subtle, ephemeral, non-documentable social norms and cutoms that permeate and regulate the lives of nearly every person in this country--especially females. I've railed about this topic before, but it never ceases to astonish me, the ways in which Iraqi men subjugate and control their women with their obsessions on "reputation," "honor" and that all-purpose cudgel, "proper Muslim behavior." Men, of course, maintain no such standards of conduct: I could give a hundred examples; let these two suffice. Recently, Layla contacted a member of one of Iraq's major Shiite religious parties, requesting an interview. She and I actually spoke with this man in February, 2004, and athough they haven't met since, he told Layla on the phone that he remembered her. More than remembered her, actually: he's been thinking of her ever since--her face, her eyes, even the clothes she was wearing that day. He then asked her to marry him. Right there, on the phone! And not once, but twice.. (I was sitting next to her in the hotel lobby when she held this conversation, not knowing why she suddenly seemed to turn naueous) This bastion of Muslim propriety and Koranic teachings even sweetened his proposal by promising her a position on the party's "security forces"--which is tantamount to offerng a civil rights activist a job with the Klan. Do I even need to say it? She refused. About two weeks ago, we interviewed a businessman sheikh--a heavy-set guy with a fleshy face who radiated a kind of sleazy prosperity. At the end of our conversation--translated by Layla--the sheikh told us he had many other ideas and thoughts he wanted to share. This sounded good, and as we left his house, I asked Layla to set up another appointment with him. She refused. Wouldn't say why. This angered me, we had words, she stormed off--and it was only a few days later that she told me what had occured. Seems the oh-so-respectable sheikh had offered during the interview to make her his second wife (he already had one), showering upon her promises of a car, a house, money. In Arabic, of course, as if I was not present in the room. Layla had translated his comments for me, editing out the marriage proposal without missing a beat--you really have to hand it to her. The point is, polygamy and "temporary marriages" are legal here, meaning that any single woman is subject to the advances of any man, married or not. Even if they aren't bold enough to confess their ardor in conversation, the hope, or fantasy, burns in their minds and fills the eyes with a queasy leer. Woman back home who complain about the "male gaze" have no idea how bad it can get. Adding hypocrisy to chauvenism, the religious parties take the opposite tact in public, policing female behavior with a vigor that makes the Puritans look like jitter-bugging zoot-suiters. Yesterday, I interviewed a 22 year-old Psych grad from Basra University. She told me how, as they entered the campus each morning, she and other female students had to pass through a gauntlet of religious militiamen "hired" by the administration for "protection." The gunsels examined each woman's hejab--no showing of hair, ladies--and the length of their abiyas, staring into their faces for signs of make-up. (I've also learned that similar guards at a college in Amarra, north of Basra, scrutinize women's feet to insure they are wearing black socks--it's an Iranian thing--inducing many students to paint their feet and ankles black.) Anyone failing the Islamic Dignity test is sent home, with a stern rebuke to her parents for allowing their daughter to venture out in such a degraded state. I asked the student how this oppression made her feel, and she grimaced and curled her fingers into two trembling talons. "It burns inside," she added. "We are not free to dress or act as we like. Meanwhile, the religious parties have banned from our lives music, social interaction, relaxation. I am depressed all the time." I then asked her if she ever had "fun" in Basra; her face took on a blank, faraway look. "No," she whispered, looking at her hands folded in her lap. "I see on television the lives people live in America. And I feel my years are being wasted." Lisa, this is a 22 year old woman in the very bloom of youth! But this is what Basra has become in the aftermath of the elections. These are the unwritten, unlegislated and unchallengeable "social" and "religious" norms that have an iron grip on the city. And yet back home, you hardy find a public discussion or even acknowledgement of these shackles on human behavior--the Right is too busy congratulating itself on the progress of Iraqi democracy and the Left is obsessed with multimcultural relativism and discrediting Bush. Meanwhile, Bedouin customs and religious edicts--in short, tribal Islam--is grinding the hearts and souls and futures of thousands of Basran women into the desert sand. All they can do is curl their hands into talons, burn inside and wait for the day of their true liberation. Yours from the land of leering cleric and salacious sheikh. Call it the equivalent of taking a day trip out of the city. Fed up with moseying around the funduk, or sitting in an over-air conditioned office drinking yet another Pepsi as I interview someone, I wanted to kick back in a car and let the Mesopotamian miles roll by as I contemplated life. But where to go? About 100 kilos to the south is Fao, a small port city where security is good, the Shatt nearby and memories of the Iran-Iraq War still fresh. I asked Layla if she wanted to go, figuring she, too, felt cooped up in the city (actually cooped-up in Iraq, is more like it) and we scheduled our little jaunt for Friday, the second day of her week-end. Layla being Layla, of course, she just didn't accompany me to Fao, she organized the whole damn trip. At 10:00, a cab pulls up to the hotel, and I climb in even as Layla begins reciting a list of contacts she's arranged--the town mayor, the police chief, the head of a teaching organization called the Education Union, and so on...With traffic light on prayer-day Friday, Abbas, our sayyiq du jour has us out past the city limits in no time, bounding on the road toward the Arabian Gulf. Although it's not officially begun yet, this summer is hotter than usual, or so say the locals here. I have no basis of comparison, but I can believe the estimation is true. By 10:30, the temperature is already scorching, forcing us to roll the windows part way up to keep the air inside the car from spontaneously combusting. The a/c system is so overwhelmed that the air it blows into the car is like the blast from an electric hand-dryer. And if I'm hot, sitting in the front seat, I have to keep in mind Layla in the back, her head wrapped in a light blue scarf, her body encased in a thin black abiya. The countryside between Basra and Fao is flat, dry, parched except for some sickly-looking salt flats, and almost completely destitute of vegetation. Tattered black flags--Shia flags--fly from sticks jammed into small hills out in the desert, on the horizon, an enormous oil refinery smokes and burns and shimmers in the heat. With Layla translating, Abbas tells us how, a quarter-century ago, this expanse of dessicated earth once flowered with palms, trees, flowers, wildlife of all description--a verdant garden of date groves and streams and blessed shade. But the Iran-Iraq War destroyed it all, Abbas continued--bombs, rockets, machine gun fire cutting down and churning up the groves like a gigantic scythe and plow. We flash by berms and small hillocks with sloping sides--tank defenses and artillery emplacements. Twisted, rusting metal fragments of oil installations obliterated in the Iranian fighting. Charred and blackened stumps jutting up by the roadside--the last remains of nakhil, or date palms. 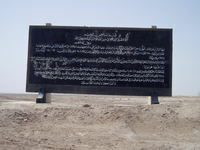 A large mural rising up from the desert floor, Arabic words carved in a large slab of black stone. Abbas slows the car as Layla translates. "Fifty-two thousand Iraqi men killed in the battle of Fao...One hundred-twenty thousand Iranians...over six million artillery shells falling in this area..." She pauses. I glance back to see she is crying. What this memorial only suggests--and what Layla remembers all-too-vividly--is the absolute horror of the war. Three days previously, I spoke with Mahmoud, a desk clerk at my hotel. From 1986-1988, he served in a chemical weapons unit, specializing in skin blistering, respiratory and nerve agents. Around Fao in 1987, he recounted, his unit fired respiratory-inhibiting gas at Iranian soldiers, only to have the wind shift and the poison blow back on Iraqi lines. "I was in the hospital for a month," he said. On another occasion near Fao, his unit fired nerve agents at advancing Iranian armies; several days later, he witnessed the aftermath of the shelling. "The ground was covered with dead soldiers. But since we were not supposed to be using chemical weapons, someone had gone to each corpse and shot them with a pistol in the head. I don't know how thousands of dead bodies, each with the same bullet hole in the forehead, was supposed to fool anybody, but that's what the Iraqi army did." Fao itself is like many southern Iraqi cities--a collection of widely dispersed pre-fab=fab cement blockhouses, separated by large fields of scrubby plants, concrete debris and trash. In the "center" of town stands a deserted amusement park, its ferris wheel inert, the other rides rusting and inoperable. Since it's Friday, almost no one's working, and the heat made even the fishermen--their colorful skiffs, canoes and boats crammed together in crowded berths--seek the relative cool of the shade. Meanwhile, on the horizon east of the city, three huge pillars of black smoke rise into the thin blue sky, marsh fires erupting on the Iranian side of the Shatt-al-Arab. In a small room inside building bearing the English sign "Educational Union," Layla and I meet with the town notables. Unlike most Iraqis I've met, they are surprisingly upbeat: security in the town is excellent, they have 24-hour electricity, water is okay--their only real problem, in fact, is unemployment, but a new port expansion project, set to begin within a few months, promises to remedy that situation. I then ask about the Iran-Iraq War. The mayor, police chief and a third man who had served in the conflict as an officer in southern Iraq, begin talking at once. Fao came under Iranian bombardment almost as soon as hostilities began in 1980, they tell me, resulting in the mass exodus of every citizen from the city. Overnight, a municipality of 80,000 turned into a ghost town--then a wasteland as the war destroyed every building. "The Iranians occupied the barren fields and turned them into a military base," the men relate. "All the structures you see in Fao date from after 1988, when the war ended." The men have to break for mid-day prayers, so we gather together a small crew and drive toward the Shatt, creeping slowly among some rutted roads past Fao's shipyards--actually, the hulls of dhows under various stages of construction--passing into a thicket of rushes and wetlands, cormorants wheeling overhead, a wild boar staring at us for a moment before bounding back into the reeds--eventually disembarking from the cab and walking about 100 yards through stifling heat to the shore. Here, salamanders and crabs are scuttling about in muddy flats, lapped by small waves from boat wakes on the waterway. After meeting some friendly fishermen--who take Layla, our guides and me for a little riverine tour of the Shatt--we return to the car. To the east, the flames are leaping higher and higher, spewing black funnels toward the sun. I walked out of the building, then down the empty boulevard toward the Shatt. Across a wide, empty field to my right, the deserted amusement park shimmered in the heat. The wind blew with a high whistling sound, kicking up swirls of dust. I found a nebk tree on a traffic island which cast just enough shade to make the heat tolerable. There I sat, listening to the wind, smelling the antiseptic smell of desert heat and feeling the thoughts drain from my head as I watched Iran burn. Readers of In the Red Zone may recall a section having to do with a woman named Hadeel, who, as I relate in the book, was killed in a suicide car blast in January 2004 as she waited in traffic to get to job in the Green Zone. Recently, I received an e-mail from Zena, my friend in Baghdad, telling me that she had been in contact with Hadeel's family and had provided them a copy of Red Zone so they could read the passage about their daughter. I asked Zena for an update on the family, and this is the e-mail she sent; I present it without comment. Just before Hadeel died, her father passed away, leaving behind Hadeel and her sister and two brothers. Then Hadeel's death, which further devastated the family. Her sister was married and pregnant, and her husband had to go to Mosul to complete some documentation, as the mother wanted the family to leave Iraq and move to Syria. On the road to Mosul, an accident occurred and the car overturned, killing the husband and badly injuring the sister. She survived, however, and by a miracle the baby she was carrying was unharmed. After she recovered, the mother took her daughter and two sons, both of who are in college, and moved to Syria. The point for me is that the situation is so tragic in Iraq, but so common for us living here. Saddam Hussein used to say that his tyranny would leave a story in every home in Iraq. He is gone, but the stories continue. The sharp ripping sound erupted somewhere close to the hotel. Automatic weapon fire, I thought, flashing back to Baghdad, where the same noise was--and still is--a constant part of city life. Perhaps it's just a wedding. But it was 9 a.m., and besides, everyone knows that the Hauwza--the religious establishment in Najaf--has outlawed the casualty-producing custom of celebrating nuptials by firing guns into the sky. A few hours later, we got the news. On the street just behind the funduk, four masked men in a Toyota emptied their AKs into a parked car, killing a police colonel from Zubair, who had come to Basra for medical treatment. The assassins are unknown, as is their motive, although rumors have it the murder had something to do with "smuggling." "Summer is coming," an Iraqi man grunted in the hotel lobby. "The Wahhabi have been quiet for awhile, but we are expecting their return with the hot weather." ...except for one not-inconsiderable detail: all the Iraqi females in the room were bound in religiously-mandated fabric prisons. Including one woman who approached me to say hello, her voice emanating from behind a shroud completely covering her face--with a shock I realized it was Haifa Malij Jaafir, who had evidently dispensed with the narrow viewing slit in her abiya in favor of head-to-foot black. (She's a sweetheart, Haifa is, asking me when I was going to return to the Union for another conversation, but I tell ya, I still can't get used to talking to someone whose voice issues, oracle-like, from behind a veil.) Anyway, by now I'm on a nod-and-press-a-hand-to-the-chest basis with a number of GC members, and since Layla knows the rest of the bunch, I spent a profitable afternoon renewing contacts and congratulating one and all on their new digs. In truth, I don't know what to make of the Mahjaless Mahafalla. Yes, many of the 41 members are alarmingly inexperienced with democracy, in the pocket of the religious parties and possibly corrupt--but they are a legislation born from a (more or less) free election, the first in this city's history. "Think of where Germany and Japan were two years after World War II--Iraq today is further along the road to democracy," a Public Administration Adviser from the British Embassy crooned. And despite one's natural tendency to become cynical in dysfunctional Iraq, I think she's right. Still mulling over the relationship between democracy, the Middle East and the liberation of Iraq, I returned to my hotel room and turned on the TV, planning to do some writing while accompanied by Arab music videos (I've develop an addiction for those damn things). Instead, I discovered that, by weird coincidence, Dubai-based Channel One was airing "Rudy: the Rudolph Giuliani Story." Work was impossible now. It wasn't the homesick-inducing views of New York that seized my attention; no, rather, it was the dateline of the movie's opening scene: September 10, 2001. I don't remember what I did that day. I do remember what we did two days before, when, on a gorgeous Sunday afternoon we walked down to Battery Park and looked out at the Statue of Liberty. Afterward, we strolled north along the Hudson, and I recall gazing up at the World Trade Center, marveling at the way the buildings reflected the late summer sun with a magnificent silver gleam. I don't care what the critics say, the Twin Towers really are beautiful, I thought. A beautiful part of my city. Ten minutes into the movie, the real-life footage began: the gaping hole in the north tower; fire erupting from the south; smoke streaming from the largest skyscraper fires in history; people on the upper floors waving white distress flags; the downward plunge of the south tower into its foundations; avalanche-like billows of white debris pouring down Vesey Street and over the spire of St. Paul's Church as the north collapsed...and for a moment, I was no longer in my hotel room, but back in New York, on the roof of our building, once again witnessing the horrible, the unimaginable, the obscene. Upsetting, yes; but somewhat eerie, too, to watch these scenes replayed in Iraq. For, of course, the reason I was even in this Basran hotel room--the reason America and Britain forces invaded Iraq, drawing thousands of people, including myself, into this country--was the nearly 3,000 people murdered on September 11. Strange, too, were the words I remember the real Mayor Giuliani expressing that day--especially his awful, emotionally wrenching statement that the "loss of life today will be more than any of us can bear"--given Arabic subtitles. Did Iraqis watching this show--say, my friendly hotel staff--identify with the mayor, or with the terrorists who humbled the Great Satan? Did they cheer the law and order sheriff or the Robin Hood of the Middle East? I can't say for sure, of course, but knowing Iraqis, my money's on Rudy. The people here desperately need--and deserve--law and order, a sense that justice can prevail against malevolent powers stalking their nation. The idea that a single man can galvanize a society to stand up to Ali Baba, be they mobsters or terrorists, and survive--unlike, it seems, the police colonel from Zubair--can only bring hope to these demoralized and suffering people. "We need leaders," a Iraqi journalist said to me over dinner last week. "But where can we find them in such a society?" Hollywood being Hollywood, Rudy's war on crime (the same war that cleaned our block of the heroin gang that had ruled it for years) was depicted with a montage of cops rousting the homeless and squeegie men and prostitutes, scored by a ominous soundtrack that evoked thoughts of fascist thugs crushing the spirit of democracy. I had to laugh. Here in Iraq, real fascist thugs--and not the imaginings of hysterical lefists--seek to crush the spirit of democracy. Here in Iraq--where serving as a policeman is the most dangerous job in the world--people can only pray for a force that is incorruptible, efficient and effective against Saddamite psychos and bloody-thirsty jihadists. They wouldn't call a man like Giuliani a "fascist," and they certainly would not call police officers "pigs." And that's not just because they're Muslims. Yours from the land where patriot acts, civil liberties and the war on crime are one and the same. But that's not what I want to talk about today. Rather, it's tamer--or dates. A few afternoons ago, I dropped by the British Consulate at "Basrah Palace"--as I've mentioned, one of Saddam's Xanadus, built alongside the Shatt-al-Arab--where I met an Iraqi man named Taha Z. Aubid. Taha is the head of the Date Palm Department of the Agricultural Directorate of Basrah Governerate--in other words, the province's go-to guy for dates. Dates were once one of Basra's main industries. In 1968, over 10 million trees grew in the province. Judging by the vintage package labels I saw displayed in one farm in Abu Al-Kaseeb, a palm-profuse area south of the city, this region supported numerous companies with names like "Babylonian Lion" and "Eastern Sun Dates" ("a product of al-Basrah"). 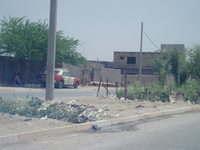 Then came Saddam, war, bad irrigation practices salinizing the Shatt and environmental atrocities against rebellious Shiites--all of which decimated Basra's date groves. Today, only three million trees are left, and most of them are dying. Taha promised to take me out to one of the largest remaining farms, owned by the illustrious Musawi family of Basra--and by the way, did I want to meet the family tomorrow at their mosque? Of course, I said, and we made arrangements. The next afternoon, Taha swings by the funduk and takes me over to the Musawi's mosque. This ain't any mosque, mind you, this is one of the largest structures in town, an enormous gold and blue-green multi-domed affair built in 1981 and named after the late family patriarch Sayyid Ali Musawi, leader of the Shaykhi branch of Shiism. 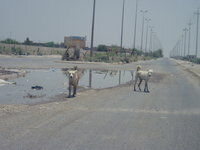 And standing at the entrance to the jaami' are two elders from the clan, waiting to shepherd me in. They are Abdul Redha--the family leader, or so I gather--and his cousin Ibrahim. Both are in their late 60s or early 70s, dignified, patrician, quiet-spoken men, spiffily-attired in neatly-pressed slacks and short-sleeved shirts--picture a pair of well-heeled Palm Beach retirees about to hit the links. We sit in a vestibule, where they relate the family background: about two hundred years ago, English-speaking Ibrahim relates, the clan fled Saudi Arabia one step ahead of the Shia-hating armies of Ibn Wahhab (the same fanatical Muslim who bequeathed Wahabbism to the world), eventually settling in southern Iraq. They became farmers--specializing in dates--bought land, moved into Basra and over time emerged as the city's aristocrats. They are wealthy, non-politcal, powerful (recently, the bandit Garamsha gang--with whom Layla and I have twice had tea, but that's another story--kidnapped one of their members, compelling the Musawis to send several hundred men into Garamsha turf to secure their relative's release) and dedicated to the betterment of Basra. And with that bit o' backstory out of the way, we rise to tour the jaami'. Funny thing about mosques, and this one in particular. The first floor is a vast, clean, white, spacious, air-conditioned expanse, illuminated by dozens of small golden candelabra, its basketball court-breadth paralleled by a second floor over which depends a crystal chandelier whose opulent profusion of lights is reminiscent of the alien spaceship in Close Encounters. The mosque normally accommodates some 7-8,000 worshipers--10,000 on religious holidays--the majority of whom, Ibrahim notes ingenuously, are men. Of course they're men. Men are the only people allowed to utilize the vast, clean, white, spacious, air-conditioned floors. Women have to use two narrow, undecorated, un-air-conditioned, shabbily-carpeted areas, the access to which is up forbidding concrete steps in a darkened corridor. Worse, these prayer pens possess opaque windows that prevent female worshipers from seeing into the main floor and witnessing the imam lead the Friday services (they can watch him on wide-screen TV, though). They can't see even view the Spielbergian extravaganza on the second floor. This gender discrimination is not limited to the Musawi mosque, of course. Many, if not most, jawaami' short-shrift female Muslims with entrances, facilities and salat areas that are separate and unequal. Another point about the Sayyid Ali Musawi mosque. Nearly every business in Basra is family-owned: there is no public ownership, no stock market, few joint ventures. The Musawi's various enterprises include a construction firm, which built the jaami'--and because their laborers perceived jaami'-building as religious duty, Ibrahim noted, they worked on the mosque for free. Not much circulation of capital on this project, it seems--rather, we're in the realm of modern religious feudalism. It was pleasant, I admit, to meet Basrans who didn't--on the surface, at least--seem traumatized by tyranny and war (especially the impishly-humored, Paris-educated Dr. Zaineldin). And it was a relief to spend the afternoon in surroundings that weren't dirty, hot, dilapidated and beset by periodic blackouts. Perhaps this is the emotional pay-off for feudalism, I mused. Amidst the collapse of civilization--and Iraq is nothing if not a collapsed civilization--people who possess resources and offer protection against catastrophe become objects of admiration, respect and obeisance. And for their part, with their mosque- and hospital-building, the Musawis exhibit the noblesse oblige demanded of the feudal lord. Barons, barbarians, religious fervor--and cell phones. Call it Basra, call it medieval modernity. One final observation. According to Dr Zaineldin, his institution lacks the one facility you'd expect in a well-equipped Iraqi hospital--an emergency ward. "The British asked us to close it down," he explained. Why? Seems it was encouraging young tribal bucks to go out a-feuding, get themselves shot up, then receive top-notch treatment in the most advanced medical center in town. Which means that should you have an accident in Basra today, don't try calling 115 for help, and don't bother going to the hospital. Better to do what Iraqis have always done--shut your mouth, suffer in silence and hope for better days. Yours from the land of the Mosqueteers and Hospitalers. "If you're not reading Steve Vincent's In the Red Zone blog, why not?" "In the great tradition of behind-the-scenes war reports." Why Are All the Good Names Gone?